One of my favorite places for a quick overnight backpacking trip is above Snow Canyon State Park in Utah along the Red Mountain Trail. I’ve traditionally backpacked this trail while visiting family during the winter holidays. St. George, Utah enjoys warm winters, but at elevation, Snow Canyon experiences snow and freezing temperatures. What was once a rugged 4×4 jeep trail has been transformed in the last few years into a multi-modal bike, hike, and equestrian trail that brings visitors to the north rim of Snow Canyon. The views of the canyon and its multi-colored edges are impressive, which is one reason this trail enjoys its popularity. The trailhead has ample parking for horse trailers and sedans alike. As of this writing, there are no permits required or fees for hiking this trail. The first mile of the trail is contained within a fenced corridor that leads users to a final gate that helps prevent vehicles from traversing the terrain. The first viewpoint is available after mile two. Most visitors are day hikers who come to enjoy the views at this first lookout area. Primitive camping areas can be found along the rim edge, beginning at the Snow Canyon lookout. However, due to this areas popularity, I recommend continuing down the trail to avoid other visitors and improve everyone’s experience. There are no water sources along this trail, except in the winter where snow can be melted. During the summer monsoons, rain water can be collected or found in rock wells. I recommend bringing 2+ liters per day per person. The views at the first lookout are some of the most impressive, especially at sunrise and sunset. There are an assortment of juniper trees and large rocks that can afford anchor points for hammocks. I love this area for its rugged camping experience and the challenge of hanging a hammock from large boulders. It’s a great opportunity for Leave No Trace camping. For the more adventurous, the Red Mountain trail continues for a few more miles with lookouts over Hellhole, overlooking Ivins, Utah. 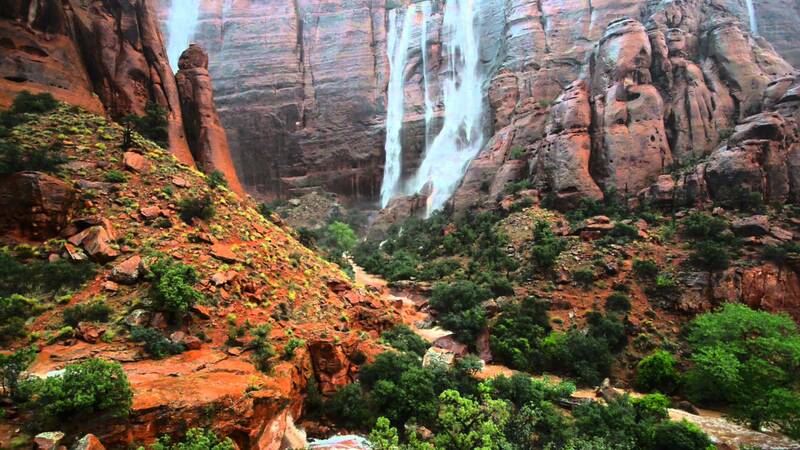 During the monsoon season, this area transforms with impressive waterfalls and flash floods. Great report. It looks like a really cool place. Your panoramic shots turned out really good too.